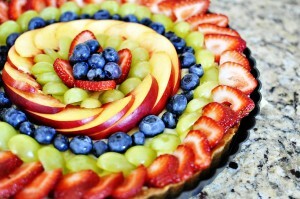 Fruit Tart using Smitten Kitchens' Unshrinkable Crust recipe and Ina Garten's Pastry Cream recipe. The pastry cream recipe is easy to make and to die for! You could used store bought pie crust and the pastry cream recipe with some fresh strawberries, so yummy. One alteration I did make on the Pastry Cream recipe is to add a bit more milk or a little less corn startch so the cream isn't as thick. This was my second attempt at a crust and it wasn't half bad. I the tart dough is a little hard to work with because its so crumbly, using alot of saran wrap helped.